Everyone has been putting bumper stickers on cars for as long as bumper stickers have been around. Have you thought about putting bumper stickers on your laptop? That’s what I’ve done. It works for me because I take my laptop out and about. I love to work in coffee shops and other places to get away from the house and I figured I can do some political advertising while I’m working. 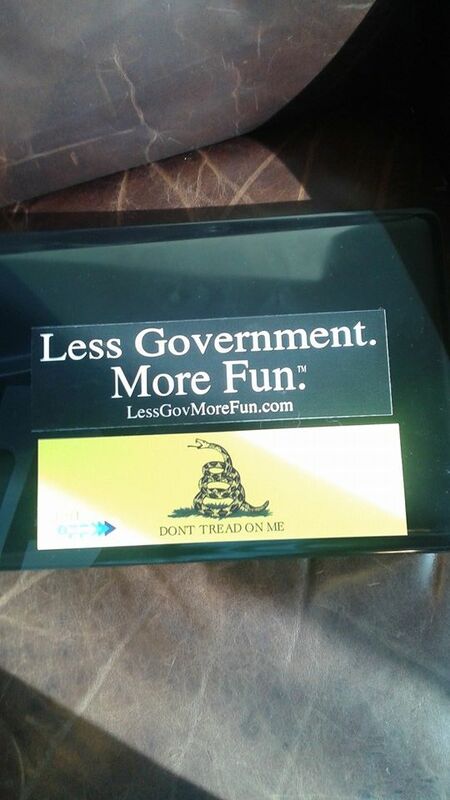 The first sticker, “Less Government, More Fun” is part of a line of gear that’s sold here. I got the sticker, along with some wristbands, and at least one camo koozie free when I ordered one of their mint colored T-shirts with that slogan. When I wear the shirt out, I get lots of attention, which is weird becaue I actually try to avoid attention when I’m out. The second sticker I’m afraid is not for sale, well at least the version I have on my computer. The sticker is a Gadsden flag (you can find plenty of those stickers anywhere), but mine came from Generation Opportunity. I got it when I filled out a questionaire and survey from them. The problem was I didn’t what to do with it because I already had a Gadsden flag sticker on my truck, so I decided to put it on the laptop. Am I the only one who decorates their laptop? If not, what do you have on yours? Sound off in the comments!